Step 1: Arrange the data. 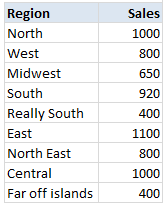 Arrange the data like this. 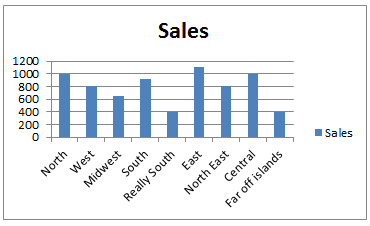 Select the data, insert a stacked column chart (why not a regular column chart?, you will understand in a minute). Select chart’s plot area. Press CTRL+1. 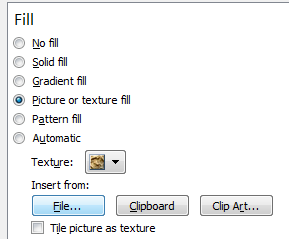 Choose picture or texture fill and select the file with image you want. Now add this series to chart. Now, we are almost done. Our chart looks like below. We just need to format it. Fill the dummy series with a chosen background color. Add borders to data series. Border color should be same as background color. Adjust the border thickness to 3pts. Adjust axis maximum to 1,400 (or any value you have selected in Step 4). Remove grid lines, legend and any un-necessary chart fluff. Your column chart with background image is ready! The main purpose of a chart is to convey information. 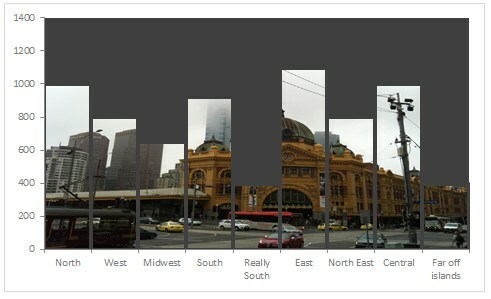 By adding a background images, sometimes your chart will be difficult to read. So I suggest you to go easy with background images. Click here to download Excel file with this chart and play with it. Examine the chart formatting settings to understand this technique better. Do you use background images in your charts? I confess. I rarely use this technique, because finding good background image that can reveal data is very tricky. The oil rig image is an excellent choice. Also, certain things like drop-shadow for data series are not possible with our technique (as gap width = 0%). But I enjoyed figuring out this puzzle. What about you? Do you use such charts? Please share your tips and techniques using comments. I like to visualize routemaps with scattered XY charts with outlined county maps as the background images. They're nowhere near perfect but they'll do the trick. It would be a blast if I knew how to use GeoCodes as the XY coordinates for the chart but I don't know how to transpose them to the flat surface so I have locate the coordinates for zip codes manually. 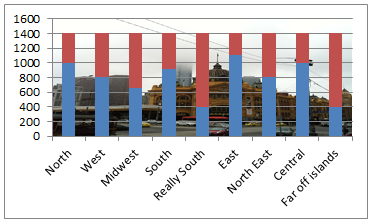 Also, sometimes Excel seems to display the chart background image differently (=the background image of the chart is usually displayed as solid grey/black background) so it is often times better to layer the chart with invisible background on top of the map on the workbook and then just group them together. Great idea, Chandoo -- works well in PowerPoint too! I like how you creatively solved this problem, which is what Excel development is all about. But it's my sworn moral duty to tell people it's not a good idea to put a chart like this on a dashboard or report. just say no. Just as an after thought: if anyone is wondering why you shouldn't put a chart like this on a dashboard, take a look at Chandoo's previous post on the ten rookie mistakes when making dashboards. I really like this thing. Thanks chandoo. Wow, this submission has provoked a deep ambivalence within me; it illustrates brilliantly how pretty visuals override the meaning of data. I accept that, when reporting on data, distraction will hide the meaning. However, this, and the 'Pie Chart' article before it, demonstrate the requirement to actually practice such techniques. In practicing, one develops a firm control over the information, appreciating how eye candy distorts and so honing clarity through avoidance. The greatest properties of pretty graphics is that they do distract and attract the viewers attention. In context, this may be the main objective of customers within image centric organisations like PR and Advertising to name just two. Hmm...While I'd be wary of putting this in most of my sheets, I definitely could see it's place in an infographic or annual report or something in general with basic info. It is really nice and useful. I have data which I updated daily so its dynamic, hence I have made a simple pivot to give me consolidated numbers. 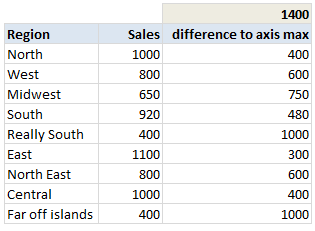 with these number is pivot table, I created a chart which I send it to my boss. so my question how to format the chart in above mentioned style. I tried but could not do it. Then change your chart type to 100% Stacked Column. It was really Awesome trick. i absolutely love the way you present your charts. i am new in the field of Analysis and i have found some of your work very helpful. i would love to know more though. Great work you are doing. I tried this till 4th step but i can't proceed further for the next step. can you tel me how to do the 4th step in a easy way. 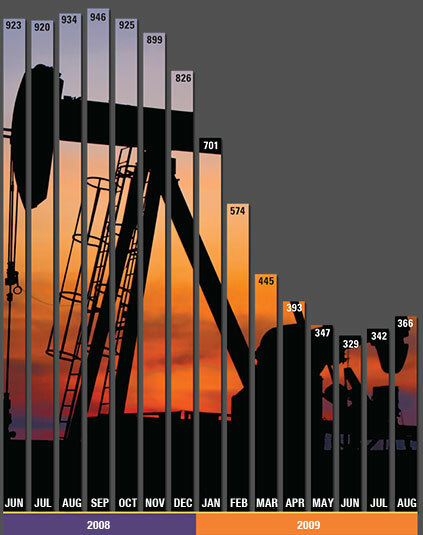 Can you please show us how to put the figure values in the bar with color contrasting to the background as the chart with the Oil RiG ! It is not working on pivot charts. Is there any way I can do it on pivot charts too? Lovely step by step explanation. I landed on your blog some days ago and since then i am coming regularly. this is a really cool idea. I would like to publish a German YouTube-tutorial demonstrating this technique. There will be a link to this site, of course. @Andreas... Thanks for the feedback. Please go ahead with the video. I am sure (y)our German readers would love it. I also added some eye-annoying images behind some (not transparent) charts, with the goal of providing additional information about the criticality of the displayed trends. Unfortunately, the images are not displayed on other sources, even though I uploaded them, into a similar relative directory structure. My fear is that they are referenced with absolute path. Do you know somehow the reason, maybe even the solution (maybe in C#: I ma using chart.SetBackgroundPicture(backgroundImageFile);)?